A non-primary road sign near Bristol shows Guildford Rules patches. Road signs used in the United Kingdom conform broadly to European norms, though a number of signs are unique and direction signs omit European route numbers. There is a vast range of signs in use on British roads, from directional sign posts, to signs warning of possible hazards ahead, and regulatory signs instructing motorists to perform certain actions. A pre-Worboys road sign on Meadrow, in Farncombe. Only a handful of these pre-1963 signs still exist. Modern British road signage can be traced to the development of the "ordinary" bicycle and the establishment of clubs to further the interests of its riders, notably the Cyclists' Touring Club (CTC), the National Cyclists' Union (NCU) and the Scottish Cyclists' Union (SCU). By the early 1880s all three organisations were erecting their own cast-iron "danger boards". Importantly, these signs warned of hazards, rather than just stating distances and/or giving direction to places, acknowledging the fact that cyclists, like modern motorists, were unlikely to be familiar with the roads they were travelling along and were travelling too fast to take avoiding action without prior warning. In addition, it was the cycling lobby that successfully pressured government in 1888 into vesting ownership of and responsibility for roads with county councils in previously established highway districts (HDs) that would be funded from taxation rather than tolls. The HDs were active in the erection of semi-standardised directional signs and mileposts in the latter years of the 19th century. The rise of motoring after 1896 saw the pattern repeated. The larger motoring clubs, notably The Automobile Association (AA) and the Royal Scottish Automobile Club (RSAC) erected their own, idiosyncratic warning boards and direction signs on a wide scale. In addition, under the Motor Car Act 1903, four national signs were created, supposed to be set at least 8 ft (2.4 m) from the ground and 50 yards (46 m) from the reference point. These signs were interesting in being based on shape, rather than text or image; a white ring (speed limited as marked on a small information plate below it); a white (sometimes red) diamond (a "motor notice" such as a weight restriction, given on a plate below); a red disc (a prohibition); and a red open triangle (a hazard or warning). These latter two could be given detail by the attachment of an information plate below, but often it was left to the motorist to guess what the sign was referring to and local variations as to the definition of what was a prohibition or just a "notice", for instance, were common. In spite of this confusing beginning, this format of sign was to develop into the British road sign that was standard from 1934 until 1964. Before this time, until 1933, when regulations for traffic signs were published under powers created by the Road Traffic Act 1930, "national" road signage specifications were only advisory. Following a review of 'national' signage in 1921 a limited number of warning and hazard information plates were enhanced by the use of symbols, rather than text only. Such symbols had been developed in continental Europe as early as 1909, but had been dismissed by the UK, which favoured the use of text. The symbols were simple silhouettes, easy to 'read' at a distance. Some were peculiarly British: 'SCHOOL' (and later 'CHILDREN') depicted by the flaming torch of knowledge. The government was to make increasing efforts to standardise road signs in the Road Traffic Act 1930 (RTA) and regulations of 1933, being finally consolidated with the publication of the 1934 Road Traffic Acts and Regulations handbook. These saw the end of the very individual black and yellow vitreous enamel AA signs (although the AA was still allowed to erect temporary direction signs, and still does). While the RSAC had ceased erecting signs, the Royal Automobile Club (RAC) had begun to do so to RTA specifications (save for the inclusion of the RAC badge) and was very active in this respect in the late-1930s. The national British signs were now a red disc (prohibition), a red open triangle (warning/hazard), a red ring (an order), and a red open triangle in a ring for the new (1933) warning with order 'SLOW - MAJOR ROAD AHEAD' and 'HALT AT MAJOR ROAD AHEAD' plates (the predecessors of 'GIVE WAY' and 'STOP' respectively). All signs were to carry information plates mounted below them, the warnings or hazards being illustrated with a wide range of prescribed symbols, but with a text panel below, being only text where no symbol existed. Lettering and symbols were black on a white ground except for orders (like 'TURN LEFT') which were white on blue. New to the UK were the first combination sign, which incorporated information on the sign itself, the 30 miles per hour speed restriction (introduced in 1934), with '30' in black letters on a white disc (the information) surrounded by a red ring (the order sign). It was accompanied by its 'derestriction' a white disc with a diagonal black band bisecting it. Neither of these signs required separate information plates. The 1934 RTA&R also clarified direction and distance signage which also remained in that form until 1964. All signs were mounted on posts painted in black and white stripes, and their reverse sides were finished black, green, or more rarely (usually after repainting) white. The 'HALT' plate was unique in being T-shaped; orders were mainly landscape and warnings always portrait. Sizes were strictly prescribed, the warning plate being 21 by 12 inches (53 cm × 30 cm) with the surmounting triangle 18 inches (46 cm) equal. In preparation for invasion during World War II, all navigational signposts and railway station signs were removed, to confuse potential enemy ground movements. Old-style sign warning of a school ahead, still in existence in Glastonbury, Somerset. The national signs were subject to minor modification, mainly in the early post-World War II years. For instance, 'SCHOOL' became a schoolboy and girl marching off a kerb, 'CHILDREN' a boy and girl playing handball on a kerb's edge. A train 'CROSSING NO GATES' was given a more toy-like locomotive. Meanwhile, the triangle was inverted for 'HALT' and 'SLOW', while 'NO ENTRY' became a combination sign - a red disc bisected by a horizontal white rectangle bearing the lettering. Orders were now black on white, save for 'NO WAITING', which was black on yellow in a red ring. Some of these changes were part of an attempt to reflect European standards. Early road signs were usually cast iron, but this was increasingly displaced by cast aluminium in the 1930s. Cast signs were designed to be maintained by being repainted with the raised lettering and symbol easily picked out by an untrained hand. This sort of sign was sometimes given an element of night use by the inclusion of glass reflectors. An alternative to casting and painting was vitreous enamelled sheet iron or steel. In the 1950s cast signs were quickly displaced by sheet metal (usually aluminium) coated with adhesive plastics; these could be made reflective, famously by Scotchlite. Such signs had become almost universal by the reforms of the early 1960s. The major reform of UK road signage to better reflect European practice happened in two stages. The first was associated with the first motorway construction project and the development of a signage system for it by the Anderson Committee of 1957. Although it was additional to the existing signage, it set a number of benchmarks that were developed under the Worboys Committee of 1963 that was largely responsible for the road signage system effected from 1964, which is still current. Until Worboys, the most notable differences between European signs and those in the UK was their reliance on symbols without text wherever possible, thereby increasing the internationalism of their 'language', together with their combined nature, for instance the warning signs having the symbol inside the triangle instead of on a separate information plate. The Worboys Committee recommended that such practices were adopted in the UK and the 'New Traffic Signs' of 1964 were part of the most comprehensive reformation of the UK streetscape that the country has experienced. Unlike previous government efforts to regulate signage, which tended to be cumulative, Worboys argued a modernist position of starting from zero, with all previous signs being deemed obsolete, illegal even, therefore subject to total and systematic replacement. As a result, local authorities were charged with massive resignage programmes. Order and Prohibition signs were almost all replaced within a couple of years, with the warning and direction signs taking somewhat longer. Few pre-1964 warning signs survived more than about ten years, and, while direction signs were similarly replaced, more have survived as they were not deemed as essential as the others in regulatory terms. The system currently in use was mainly developed in the late 1950s and the early 1960s, with additional colour-coding introduced in the mid-1980s. There were three major steps in the development of the system. The Anderson Committee established the motorway signing system. The Worboys Committee reformed signing for existing all-purpose roads. The Guildford Rules introduced features to indicate different categories of route. In 1957, a government committee was formed to design signs for the new motorway network. A system was needed that could be easily read at high speed. Colin Anderson, chairman of P&O, was appointed chairman; T. G. Usborne, of the Ministry of Transport had charge of proceedings. Two graphic designers were commissioned to design the system of signage: Jock Kinneir and his assistant (and later business partner) Margaret Calvert. The new signs were first used on the Preston bypass in 1958. The UK government formed another committee in 1963 to review signage on all British roads. It was chaired by Sir Walter Worboys of Imperial Chemical Industries. The result was a document that defined traffic signing in Britain: Traffic Signs Regulations and General Directions (TSRGD). It was first introduced on 1 January 1965 but has been updated many times since. It is comparable with the Manual on Uniform Traffic Control Devices in the United States. The TSRGD is a Statutory Instrument that prescribes the sign faces and permitted variants that may be used on UK roads. The TSRGD is supported by the Traffic Signs Manual (TSM), which consists of 8 separately-published chapters which provides "the codes to be followed in the use, siting, and illumination of signs both on all-purpose roads and motorways. It also covers temporary signs for use in connection with road works, in emergency by the police, and temporary route signing by motoring organisations and highway authorities." As part of an effort to eliminate sign clutter in the mid-1980s, a colour-coding system was developed to indicate information pertaining to different categories of route on a single sign. The system became known as Guildford Rules, after the town of Guildford, where experimental versions of this signing system were tested. 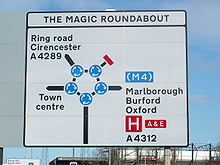 A sign at the Magic Roundabout in Swindon incorporating mini-roundabouts into signage. (The correct method, introduced in the 1994 TSRGD, is to use a black disc with a central white dot for each mini-roundabout.) This peculiarity is common in Wiltshire. Road signs in the United Kingdom are governed by an extremely complex and detailed set of guidelines. The basic units of measurement used by sign designers are the 'x-height' (the height of the lower case letter 'x') and the 'stroke width' (sw) (4 sw = 1 x-height). The sizes of borders, symbols and arrows and the spacing and layout of the sign face are expressed in sw, so that all the elements remain in proportion. The x-height of a sign is dictated mainly by the speed of traffic approaching it, hence 300 mm x-heights are common on motorways, whereas parking signs are mostly at 15 mm or 20 mm x-height. Traffic signs are generally designed using specialist computer software. The two most popular systems are SignPlot from Buchanan Computing, and KeySIGN (previously AutoSign) from Keysoft Solutions, originally developed in the 1980s by Pete Harman and Geoff Walker whilst working for Humberside County Council. Almost all signs have rounded corners. This is partly for aesthetic reasons. It is also safer for anyone coming into contact with a sign, and it makes the sign more durable, as rain is less likely to corrode the corners. The United Kingdom uses mostly imperial units on road signs for distance measurements and speed limits. Vehicle weight limits are signed only in metric (TSRGD 1981), and metric units may be used in addition to imperial ones for height, width and length restrictions. From March 2015, all new height and width restrictions are to have dual metric-imperial units. This is because of the disproportionate number of bridge strikes involving foreign lorries (between 10 and 12% in 2008). In November 2014 it was announced that all new height and width restriction signs installed from March 2015 would have dual metric-imperial units. Three colour combinations are used on Worboys direction signs depending upon the category of the route. All roads are categorised as either motorways (white on blue), primary routes (white on dark green with yellow route numbers), or non-primary routes (black on white). TSRGD 1994 also prescribed a system of white-on-brown direction signs for tourist and recreational attractions. TSRGD 2002 updated this and introduced a system of black-on-yellow signs for roadworks. TSRGD 2016 is the current version in force. On Advance Direction Signs, as introduced under the Guildford Rules, the background colour indicates the category of route on which it is located. On all directional signs, destination names are placed on the colour appropriate to the category of route used from that junction. A panel of one colour on a different colour of background therefore indicates a change of route status. A smaller area of colour, called a patch, surrounds a bracketed route number (but not its associated destination) to indicate a higher status route that is joined some distance away. A patch may only be coloured blue or green. Signs indicating a temporary change, such as roadworks or route diversions, are denoted with a yellow background. Usually these signs use a simple black on yellow colour code, more complex signage use the conventional signs superimposed onto a yellow background. In some areas, such as the Dartmoor National Park, additional signs and colours are used to distinguish road conditions. In addition to the national colour schemes, the park also uses white signs with a light blue border and text to denote routes suitable for medium-sized vehicles and white signs with a brown border and text for routes suitable for cars and small vehicles only. The park also uses fingerpost signs for routes suitable for local traffic only. These routes are publicised in park leaflets and other media. Two typefaces are specified for British road signs: Transport and Motorway. Transport is a mixed-case font and is used for all text on fixed permanent signs except route numbers on motorway signs. It is used in two weights: Transport Medium (for light text on dark backgrounds) and Transport Heavy (for dark text on light backgrounds). Motorway has a limited character set consisting of just numbers and a few letters and symbols needed to show route numbers; it has elongated characters and is designed to add emphasis to route numbers on motorways. Motorway is used to sign all route numbers on motorways themselves, and may also be used on non-motorway roads to sign directions in which motorway regulations apply immediately (such as motorway slip roads). Motorway Permanent is light characters on a dark background; Motorway Temporary is dark on light. Transport Medium and Motorway Permanent were developed for the Anderson Committee and appeared on the first motorway signs. The other two typefaces are similar but have additional stroke width in the letters to compensate for light backgrounds. These typefaces are the only ones permitted on road signs in the UK. Although signs containing other typefaces do appear occasionally in some places, they are explicitly forbidden in government guidelines, and are technically illegal. Signs in Wales are generally bilingual, such as this "historic route" sign on the A5 near Menai Bridge. Bilingual signs are used in Wales. Welsh highway authorities, until 2016, could choose whether the signs in their area were "English-priority" or "Welsh-priority", and the language having priority in each highway authority's area appeared first on signs. Most of south Wales used English-priority while western, mid, and most of northern Wales were Welsh-priority. New regulations that came into force in 2016 mandate all signs to be in Welsh first, with the existing "English-priority" signage being replaced only when they otherwise would. Bilingual signs were permitted by special authorisation after 1965 and in 1972 the Bowen Committee recommended that they should be provided systematically throughout Wales. A small number of multilingual signs exist in the UK on major roads that leave major ports (such as Dover). They detail in English, French, German, and, occasionally Swedish, standard speed limits and reminders to drive on the left. Multilingual 'no stopping' signs exist in several locations on the M25. In the Scottish Highlands and Islands, many road signs have Scottish Gaelic in green, in addition to English in black. This is part of the Gaelic language revival encouraged by many, including the Scottish Government and Bòrd na Gàidhlig. Class 1 (engineering grade) is a low performance glass bead product, it was the first reflective material used on the UK network and invented by 3M. Today in the UK it is used only for street nameplates and parking signs. Class 2 (high intensity) is generally a microprismatic product which uses truncated cube corners to return light to the driver. It is commonly used for directional signs or less important regulatory signs. There are also high intensity glass bead products that meet this class. Class 3 (diamond grade) is a high end microprismatic product for important signs, those on high speed roads and in areas of ambient lighting where a driver may be distracted by the light clutter. Class 3 can be divided into two divisions; 3A for long distance and 3B for short distance. Currently the only product that performs to these levels is Diamond Grade™ DG³. The importance of a warning sign is emphasised by the red border drawn around it and the triangular shape. Some warning sings do not have a red border like sharp deviation. Priority through the junction is indicated by the broader line. Examples below exclude low bridges, railway and tramway level crossings, bus and pedal cycle facilities, traffic calming and road works. Worded warning "Ford" may be varied to "Flood", "Gate", "Gates" or "No smoking"
Plate used with "ice". may be varied to "snowdrifts"
Other danger ahead. This sign must be accompanied by an information plate specifying the nature of the danger. Fire station ahead, STOP when lights show. "FIRE" may be varied to "AMBULANCE"
Signs in circular red borders are prohibitive, whether or not they also have a diagonal red line. Circular blue signs mainly give a positive (mandatory) instruction. Such circular signs may be accompanied by, or place on, a rectangular plate (information) that provides details of the prohibition or instruction; for example, waiting and loading plates and zone entry signs. 'Stop' signs (octagonal) and 'give way' signs (inverted triangle) are the two notable exceptions, the distinctive shapes being recognisable even if the face is obscured by dirt or snow. Plate used on "vehicles carrying explosives"
Some level crossings in the United Kingdom do not have gates or barriers. These crossings will have several signs posted on approach and at the crossing. Some roads and pavements are shared with cyclists and buses. The word "local" on the bus symbol means the only buses that may use the lane are those running a local service. Where the word "local" is not shown, the lane may be used by any vehicle designed to carry more than 8 passengers, excluding the driver, and local buses. Solo motorcycles may use the lane where the motorcycle symbol is shown on the signs. Other vehicles may enter and stop in a bus lane to load and unload unless signs alongside the lane indicate otherwise. Waiting restrictions are indicated by both signs and road markings. On-street parking places may be designated for a particular class of vehicle (e.g. solo motorcycles or car) or for a particular user (e.g. permit holders or disabled badge holders). Parking may be free or paid for (e.g. "pay and display" or parking meters). There may be a time limit on the period of stay and a minimum time before returning to a particular parking place. Where a plate does not indicate the days of the week, the restrictions apply at the same times on every day, including Sunday. Where the time of day is not shown, the controls apply for 24 hours. If a bank holiday falls on a day when the controls are in operation, the controls apply in the normal way unless the plate states that they do not. Special controls may apply on days when a large event is being held. For use on busy motorways and other wide roads where verge mounted signs would be frequently obstructed by other traffic. An advance direction sign (ADS) generally has blue, green or white as its background colour to indicate the status of road (motorway, primary or non-primary) on which it is placed. Except on the main carriageway of a motorway, coloured panels are used to indicate routes from the junction being signed that have a different status. A direction sign (DS) should always be a single colour indicating the status of the road to be joined, although there are a few rare exceptions to this rule. The Heavy and Medium typefaces were designed to compensate for the optical illusion that makes dark lines on pale backgrounds appear narrower than pale lines on dark backgrounds. Hence destinations are written in mixed case white Transport Medium on green and blue backgrounds, and in black Transport Heavy on white backgrounds. Route numbers are coloured yellow when placed directly on a green background. Some signs logically show the closest destination on the route first (i.e., on top), while others show the most distant settlement first. On a roundabout DS, the route locations are usually listed with the closest destination at the bottom and the furthest away at the top when going straight ahead, and likewise going left and right. However, many left-right signs more logically indicate the closest destination at the top with further afield destinations listed in descending order. Destinations/roads which cannot be directly accessed on a driver's current actual route, but can be accessed via an artery route of that carriageway, are displayed in brackets. All types of ADS (but not DS) may optionally have the junction name at the top of the sign in capital letters in a separate panel. A route confirmatory sign is placed either after a junction where distances were not shown on the ADS or DS or is placed on an overhead information sign but does not show distances to the destinations along that route. Leave the Motorway for A38 to Mansfield and Matlock (via. A615). Continue for the North, Leeds and Sheffield. Temporary Speed advised of 20 miles per hour (32 km/h) due to prevailing traffic or weather conditions. Temporary Speed advised of 30 miles per hour (48 km/h) due to prevailing traffic or weather conditions. Temporary Speed advised of 40 miles per hour (64 km/h) due to prevailing traffic or weather conditions. Temporary Speed advised of 50 miles per hour (80 km/h) due to prevailing traffic or weather conditions. Lane 2 is closed ahead. Use lane 1 and proceed with caution. Lane 1 and 2 closed ahead. Use lane 3 and proceed with caution. ^ A previous signal may direct you into an adjacent lane. More than one lane may be closed to traffic. If all lanes display a red cross, the motorway ahead is closed. Motorists caught using the traffic lane are subject to a fine of £100 and will receive points on their licence. The term "directional sign" covers both Advance Direction Signs (ADS), placed on the approach to a junction, and Direction Signs (DS) at the junction itself, showing where to turn. A DS has a chevron (pointed) end, and this type is also referred to as a flag-type sign. Diversion routes are marked with black symbols on a yellow patch (square, triangle, circle, or diamond). These mark diversionary routes in the event that the road ahead is closed for any reasons. Motorists can navigate following the symbol, and can find their way back to the original road at a junction above the closure. The four symbols may be filled (solid) or outlines. They are most commonly placed on directional signs, following the route number (e.g. A 25) but may be free standing. Motorway exits have trigger signs that are normally covered. In the event of a closure, the sign is uncovered and will say, for instance, "To rejoin M6 follow (symbol)". Following the symbol will allow rejoining at a later junction. On minor roads a simple black on yellow sign with an arrow and the word Diversion is used, as here. Diversion sign on minor roads or for road works starting to left. Informational signs are mainly rectangular (square or oblong) but, strictly speaking, this category also covers directional signs. They are often coloured to match the directional signing for the status of road in question, but where this is not necessary they are generally blue with white text. Examples include "lane gain" and "lane drop" signs on grade-separated roads, and "IN" and "OUT" indications for accesses to private premises from the highway. Roadworks are normally signalled with a triangular, red-bordered warning format is used to indicate that there are works ahead. The graphic is of a man digging. Within the roadworks, diversions and other instructions to drivers are normally given on yellow signs with black script. Legally these are not defined as traffic signs in the UK. This gives authorities flexibility on the design and placement of them. They can be fixed to a signpost, wall, lamp column, or building. The text is usually in the Transport typeface used on road signs. It is also common for street nameplates to use the serif font designed by David Kindersley. Numbered location markers of one type or another are used to identify specific locations along a road. Historically, milestones were used, but since the early 20th century they fell into disuse. However, for administrative and maintenance purposes, distance marker posts and driver location signs have been erected on motorways and certain dual carriageways. The numbers on distance marker posts are embedded into emergency roadside telephone numbers and are used by the emergency services to pinpoint incidents. The advent of the mobile phone meant that location information embedded into motorway emergency telephone systems was not being accessed by drivers and since 2007 driver location signs have been erected on many motorways. These contain important information about the location and carriageway direction, and the reference number should be quoted in full when contacting the emergency services. The designs of road signs in Great Britain as prescribed in the Traffic Signs Regulations and General Directions (TSRGD) apply specifically to England, Scotland and Wales. These regulations do not extend to other territories that come under the jurisdiction of the Crown. Road signs in Northern Ireland, the Channel Islands and the Isle of Man are under the jurisdiction of their local legislatures. Although the policy in these territories is to align their road signs with those prescribed in the TSRGD, small variations may be seen. The Overseas territories have much more autonomy regarding their use of signs and these can vary quite significantly from those used in Great Britain. Roundabout direction sign in Northern Ireland. Destinations in the Republic are styled the same as domestic destinations without alluding to an international border. Traffic signs in Northern Ireland are prescribed by The Traffic Signs Regulations (Northern Ireland) 1997 and are administered by the Northern Ireland Assembly. Northern Ireland signs are broadly the same as those in Great Britain, although changes made in Great Britain are often not made in Northern Ireland at the same time. One example is the series of bends ahead sign, which was removed from TSRGD in 1975, but only removed from the Northern Ireland regulations in 1979. The Tynwald (Isle of Man Parliament), through its Traffic Signs (Application) Regulations 2003, explicitly included Part I of the TSRGD into Manx law, but not the other parts of that legislation. One of the consequences of this partial incorporation is that while in England and Wales speed limit signs had to appear on both sides of a carriageway until 2016, this was not necessary in the Isle of Man. Likewise, an all-way stop is permissible in the Isle of Man, whilst it has been prohibited in Great Britain since 2002. The Bailiwick of Guernsey, devolves road markings and signs to Alderney and Sark. Sark does not permit road transport, aside from cycles and farm vehicles. Alderney has some different road markings, but the signs are broadly the same as Guernsey. Guernsey has a unique sign "Filter in turn", which is a give way without priority. It is similar to the all-way stops found elsewhere in the world, although there is no requirement to halt. Weight restriction signs in Guernsey use hundredweight as a unit rather than SI units, although one CWT was redefined as exactly 50.8 kg in 1991. Road signs in Akrotiri and Dhekelia, on Cyprus, are controlled by the Ministry of Defence and maintain the same designs as the Republic of Cyprus. Speeds are in km/h, distances are in km. Some signs are in Turkish as well as English and Greek. Anguilla mostly uses the same road signs as the United Kingdom with minor differences. Anguilla's roads occasionally cross large dish drains requiring a vehicle to slow down to cross. Because of this, the territory has its own unique dip sign. Ascension Island mainly uses signs similar to the UK's, but the yellow diagonal signs common to the USA are also found on the island. Bermuda mostly uses the same style as the United Kingdom, with some exceptions. Speed limit signs are in km/h and all limit signs have this marked. No entry signs have "NO ENTRY" written in black down the centre as was often used in the UK prior to 1965. Goods vehicles are prohibited by class rather than weight: a generic "no lorries" sign will usually be accompanied by a list of prohibited vehicle classes. Bermuda still uses the Z-bend sign, phased out in the UK since 1975. The British Indian Ocean Territory's road signs are modelled on those of the USA's Manual on Uniform Traffic Control Devices. The road signs of the Cayman Islands are similar to the UK's, although the Transport typeface is not used and signs are written in all-caps. Pedestrian crossings are marked with a US-style sign instead of a Belisha beacon. The Falkland Islands' road signs are similar to the UK. There is an additional road sign used in the Falklands to denote mine field. The road signs of Gibraltar are similar to the UK, with some signs being reversed to reflect driving on the opposite side of the road. There are some warning signs specific to Gibraltar, mainly to do with the unique wildlife of the territory. Speed limits and distances are in metric, in keeping with the rest of the Iberian Peninsular. However, height and width clearance warning and regulatory signs are both in imperial and metric. The road signs of Montserrat are similar to those of the UK. No entry signs have "NO ENTRY" written in red down the centre, similar to the design used in the Bahamas. Road transport in Pitcairn is primarily by quad bike. Signs are modelled on those of New Zealand, although they are not kept in step with New Zealand updates. Pitcairn's uses a unique slow down sign seen in neither the UK nor New Zealand – a red octagon with "SLOW DOWN" in white. The road signs on Saint Helena are similar to the UK's. South Georgia and the South Sandwich Islands inherited the traffic regulations of the Falkland Islands when it was made a separate territory in 1985. There are very few roads on the island and they are all gravel and unmarked. The lack of road signs and official street names in the Turks and Caicos Islands was blamed for emergency vehicles not reaching their destination in a timely manner, the government has since embarked on a programme of labelling roads and installing signs. Roads are labelled in a similar way to the US and Canada. Road signs are similar to those of the UK, although older MUTCD-influenced signs, including US-style speed limit signs, have not been actively replaced and are still seen. The road signs of the Virgin Islands are similar to those of the USA . The BVI drivers manual lists British-influenced signage with occasional differences, but in reality all signs installed follow the Manual on Uniform Traffic Control Devices. In 2018, new legislation was introduced in the Virgin Islands requiring that speed limits be labelled in both mph and km/h. This article contains quotations from United Kingdom traffic regulations and handbooks, available under the Open Government Licence v3.0. © Crown copyright. ^ "Google Street View of location". Retrieved 28 February 2014. ^ a b c d "Chapter 7". Traffic Signs Manual (PDF). London: The Stationery Office. 19 October 2005. p. 8. ISBN 978-0-11-552480-6. Retrieved 19 October 2014. ^ "KeySIGN". KeySIGN Product Specification. Key Traffic Systems. Archived from the original on 13 July 2011. Retrieved 17 August 2011. ^ "Height and width road signs to display metric and imperial". BBC News. 8 November 2014. Retrieved 8 November 2014. ^ Department of Transport: "Local Transport Note 1/94", page 1. HMSO, July 1994. ^ a b c d e f "Chapter 7". Traffic Signs Manual (PDF). London: The Stationery Office. 19 October 2005. p. 16. ISBN 978-0-11-552480-6. Retrieved 19 October 2014. ^ "Dartmoor Leaflet Part 2" (PDF). Dartmoor National Park Authority. Retrieved 16 September 2011. ^ "Reflectorisation of Traffic Signs" (PDF). www.dft.gov.uk. Highways Agency, etc. Retrieved 19 October 2014. ^ a b c d e "Chapter 7". Traffic Signs Manual (PDF). London: The Stationery Office. 19 October 2005. p. 14. ISBN 978-0-11-552480-6. Retrieved 19 October 2014. ^ a b "Chapter 7". Traffic Signs Manual (PDF). London: The Stationery Office. 19 October 2005. p. 15. ISBN 978-0-11-552480-6. Retrieved 19 October 2014. ^ "£100 fine for flouting red X motorway signs planned". www.msn.com. Retrieved 20 October 2017. ^ Marshall, Chris. "Emergency Diversion Routes". Roads.org.uk. Retrieved 19 October 2018. ^ "Chapter 7". Traffic Signs Manual (PDF). London: The Stationery Office. 19 October 2005. pp. 116–117. ISBN 978-0-11-552480-6. Retrieved 19 October 2014. ^ Highway Agency. "Identification of Incident Locations". Archived from the original on 17 March 2010. Retrieved 25 July 2009. ^ Highway Agency. "Driver Location Signs (March 2007)". Archived from the original on 8 June 2009. Retrieved 25 July 2009. ^ "Statutory Instrument 2002 No. 3113; The Traffic Signs Regulations and General Directions 2002". Controller of HMSO. 16 December 2002. ^ "The Traffic Signs Regulations (Northern Ireland) 1979". 1979. Retrieved 29 October 2018. ^ "THE CHIEF CONSTABLE v MITCHELL & OTRS". The Isle of Man Courts. 11 June 2009. Retrieved 2 February 2010. ^ "The Manx Highway Code" (PDF). The Isle of Man Government. Retrieved 29 October 2018. ^ "Driving in Guernsey is different". The States of Guernsey. Retrieved 2 November 2018. ^ "The Weights and Measures (Guernsey and Alderney) Law, 1991". Retrieved 29 October 2018. ^ "Website of the Sovereign British Area, Cyprus". Administration of the Sovereign British Area, Cyprus. Retrieved 8 December 2009. ^ "Drive to work every morning Ascension Island". Retrieved 29 October 2018. ^ "Driving Georgetown to Seven Mile Beach - Grand Cayman". Retrieved 30 October 2018. ^ "Getting Around - Driving". Gibraltar.gi Tourism. Retrieved 8 December 2009. ^ "Britain's Treasure Islands". Britain's Treasure Islands. Retrieved 30 October 2018. ^ a b "Driving in the Turks and Caicos Islands". Retrieved 6 November 2018. ^ "Traffic Tips For Visitors". Retrieved 6 November 2018. ^ "Driving Tortola". Retrieved 27 October 2018. ^ "BVI Drivers' Manual". Retrieved 25 October 2018. ^ "Amended Vehicles & Road Traffic Legislation in effect". 25 October 2018. Retrieved 29 October 2018. Wikimedia Commons has media related to Road signs in the United Kingdom.